BELFAST– Voices from the Earth: an exhibition of 3-D fiber sculpture, by Susan Barrett Merrill, will be on display through July 27. A reception with the artist will be held Friday, June 29, from 3-6 p.m. at the United Farmer’s Market, 18 Spring Street. Come weave on the EarthLoom Weaving at the opening and enjoy refreshments. After the reception, explore the Art Walk in Belfast this same night! Susan Barrett Merrill has been spinning and weaving since her early 20s. She taught weaving and spinning at Haystack Mountain School of Crafts and the Kripalu Center in Western Massachusetts. Susan taught weaving at the Alcyon Center for Spiritual Studies, at retreats for cancer survivors, and has taught a special weaving program to therapists who work with wounded warriors and trauma survivors. Susan’s unique mask weaving technique came to her in a dream. She was shown how to weave faces, and when she awoke, she tried it on her loom. Susan’s fiber sculptures have been exhibited twice at the Farnsworth Museum in Rockland, Maine (home of the Wyeth collection); at the Portland Museum of Art, Portland, Maine; with solo exhibitions at the Wenham Museum, Wenham, MA, and the White Gallery, Husson University, Bangor, Maine. Susan’s masks were featured in a dance tour in Sarajevo and the Republic of Georgia. 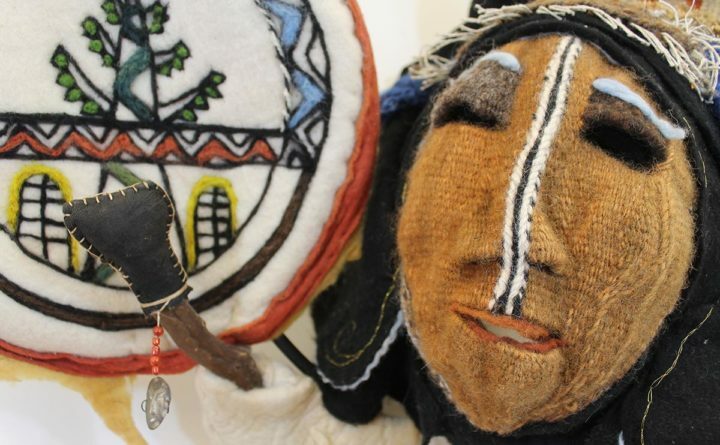 A pair of masks titled Singing Into The Wind were exhibited by invitation at the International Fiber Biennale in Chieri, Italy, and are now in the permanent collection of the Chieri Museum. Chieri is an ancient weaving city, the source of the original blue denim in the Middle Ages. Susan’s articles on weaving and personal discovery, co-authored with her husband, have appeared in Voices, the Journal of the American Academy of Psychotherapy; Handwoven, the foremost magazine for hand weavers, and Living Crafts magazine. She is a pioneer in the field of fiber arts education for people with disabilities, and has represented the United States at symposia on arts and disabilities in Kobe, Japan and Washington, D.C.